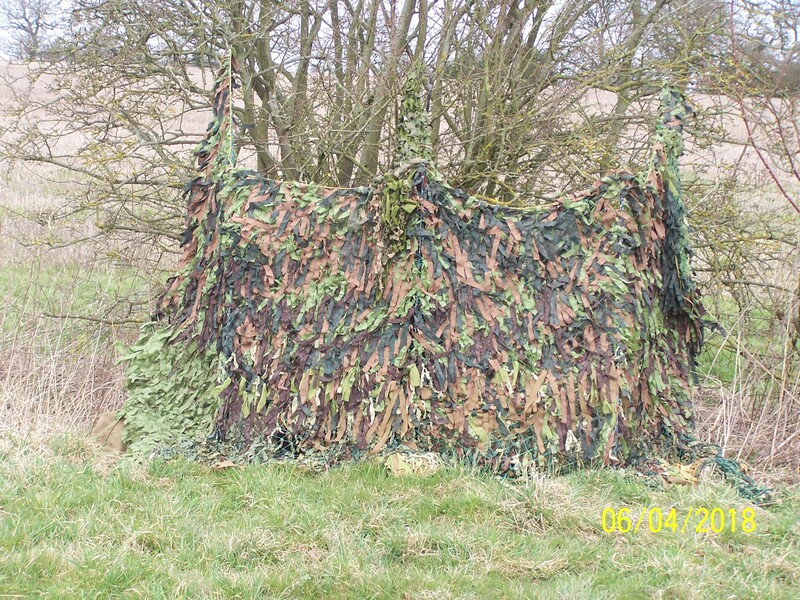 I'm often asked where I bought my hide net and the answer is I used a basic NATO European ex army net and added material strips obtained from an asian sari shop. Last year during my stay in Greece I decided to make a complete net much to the amusment of my neighbours who thought I was getting ready for war. Dont get me wrong I love Greece but I tend to get cabin fever from not shooting just a bit of fishing in the mornings. So here goes. This is a picture of the material cut into strips approx 3 x 50cm or in old money 11/4 x 20 inch. The way I do this is to roll the material in managable lengths then slice the strips and fold the strips and cut and place in a bag. The base net is woven on a two inch gauge this is approx 2 meters wide and 10 meters long. Basically its a ferret or long net. This is a picture of the net in use, I will use it more often when my original net loses its magnetic effect on pigeons. I hope this explains the how and when. look amazing, what price did it all come out at? About £ 30.00 I think. That's the dogs danglies well done mate very Impressive. Nine weeks in the sun and not a shot fired, everybody asleep in the afternoon and I get cold turkey. Bespoke net making service next! hello, another good post PC i can just see oodles of PW members now on google looking for local sari shop but on a more serious note what an excellent idea , i am sure you can buy rolls of similar material on ebay. I will take one net and one two piece to go walk about , thank you . what did you say in your dreams . Do you dress to the left or right, suits you Sir!!!!!!!! Marks out of ten. ?. 12 well done for the DIY . Arghhhh! Not that b word agiain ? The net looks great out in the field. I cannot resist asking though, are you wearing your Wifes slippers in the first photo? No, I must have distant Yorkshire connections. They are freebies from the ferry on the drive down!!!!!!! Well as we say in Yorkshire you don't get owt for nowt"! No shame in wearing the Wife's slippers sir, I do now and again. I had an uncle that went out pigeon shooting once in his slippers, forgot he had them on. Lucky it was dry weather and in a wheat field of stubble and old school small bales. I'm about to modify a large fishing umbrella, going to cut most of the material off and replace with camo netting. It's in an effort to reduce stuff in my rucksack and for speed of hide building. It may work ? The one I bought is already camo, not Decathlon, but it's a bit shiny and catches the wind, so with netting, I figure it will be more stable and less likely to end up the other side of the first field I set up in. Also I'll be able to weave local foliage into the net to blend in further. Like I said, it's an idea at this stage and may fall flat on its face.